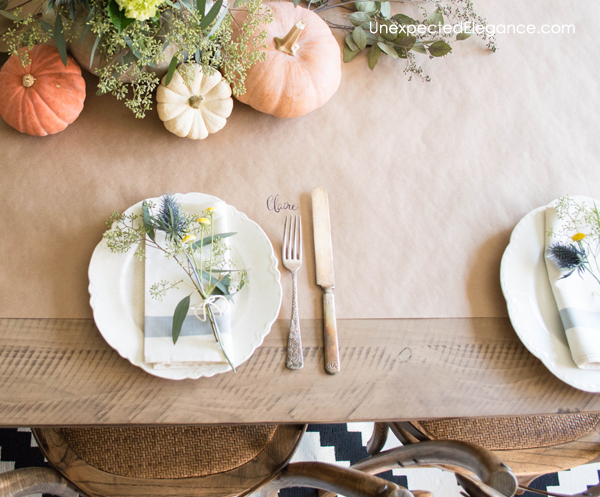 Get some great tips for an EASY Thanksgiving table and save some time to enjoy your guests! I love simple, especially when it comes to having people over to my house… you probably already knew that if you’ve read my blog for a while. I like simple but I also want my guests to know that I was thinking about them when planning the meal or gathering. So, as you know there’s always a way to combine two! 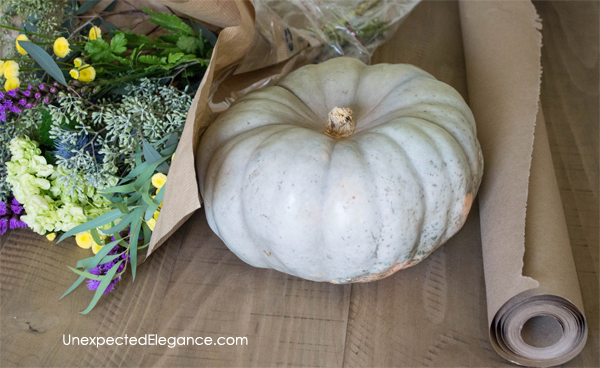 Here is a super simple and inexpensive Thanksgiving table that will make everyone feel welcome and let YOU enjoy yourself too. a bouquet of flowers from the grocery store. 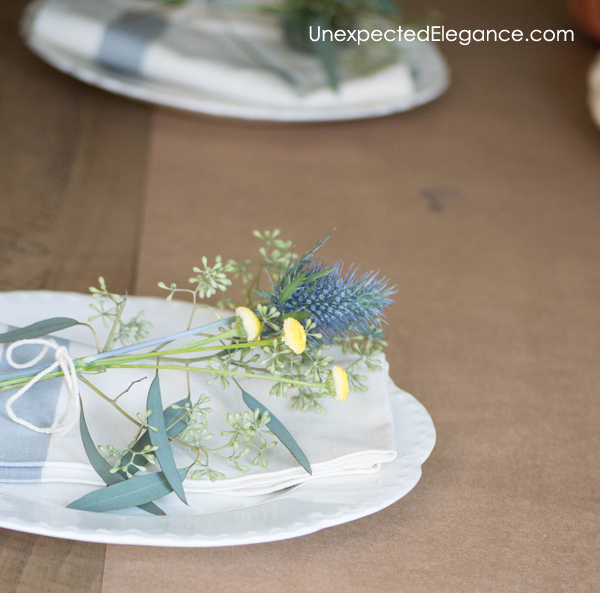 Use the craft paper as a runner down the center of the table. 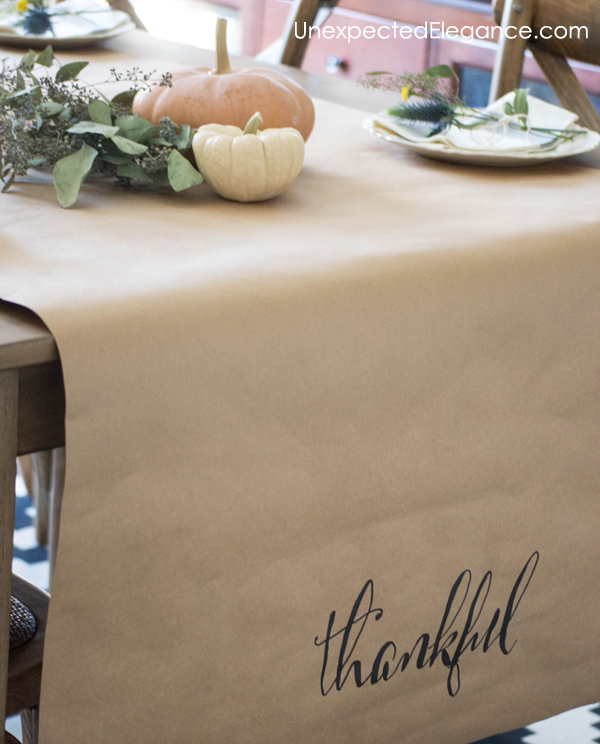 You can make it a little fancier by adding something to each end, like thankful or grateful. This trick makes clean up a little easier. It also makes a great space for writing special notes or having everyone write something they are grateful for during the meal. 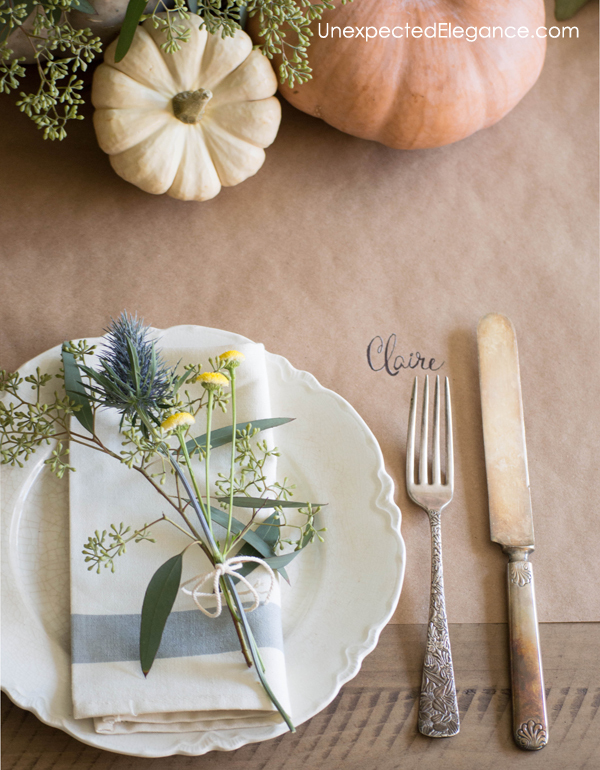 If you want to make it extra special…Assign seats by writing everyone’s name above their utensils and leave them a note about why you are thankful for them under their plate. It would mean so much to each person and be a great memory! Thanksgiving is all about sharing food with your loved ones, so I don’t think the table needs to be too fussy. The food will be the star of the show! 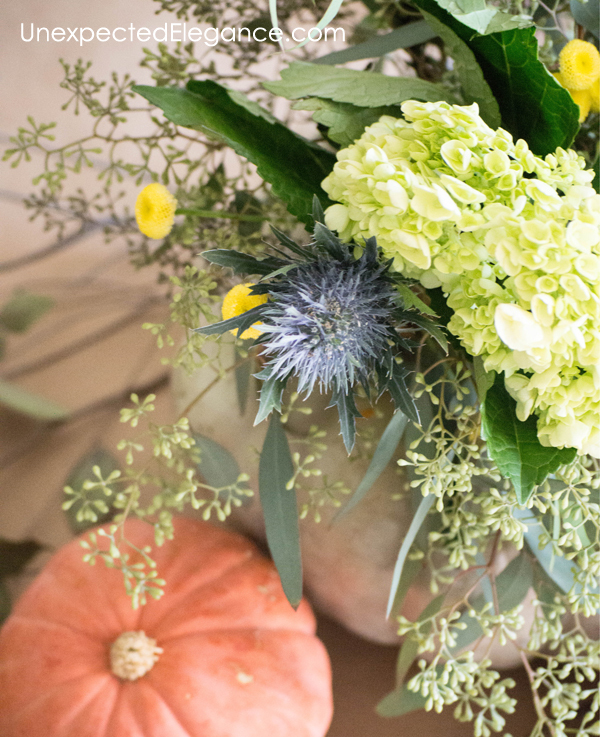 So make the centerpiece simple and short, so everyone can see each other. 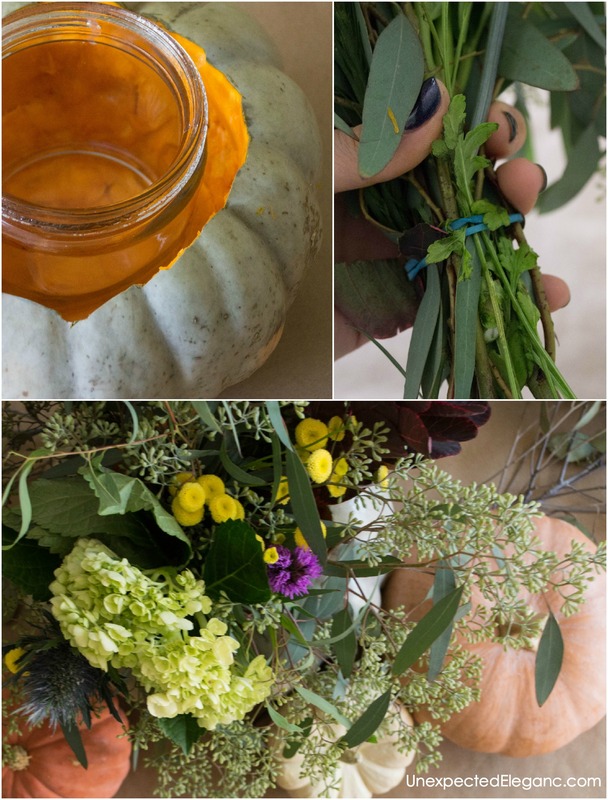 For a simple centerpiece, cut a hole in a short pumpkin or squash and place a mason jar or short glass in the center. Take the store bought flowers out their packaging and place a rubber band around the arrangement, then cut the stems short enough that the flowers are just slightly taller than the glass. If you’d like something small at each place setting, keep a few flowers out of the arrangement. Remember that keeping your decor simple frees up your time to enjoy the people you are inviting into your home. 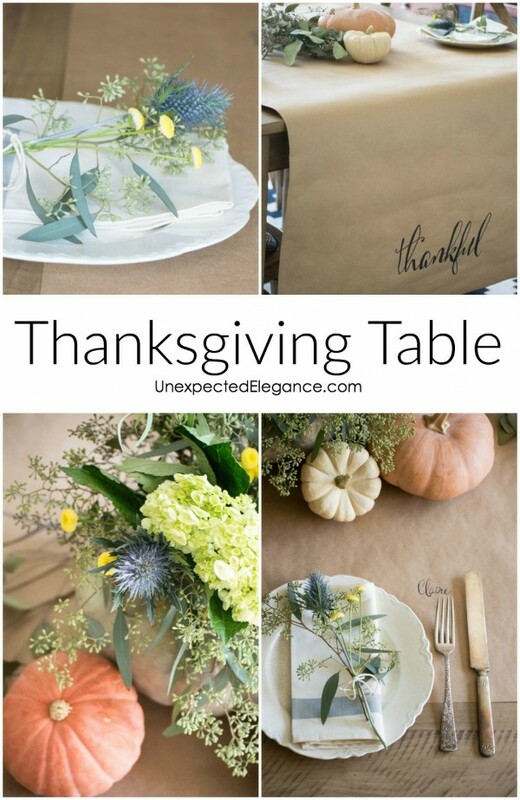 Check out this post for more ideas: Simple Thanksgiving Table. I’d love to know how you celebrate Thanksgiving. Leave a comment below to share your ideas.